The Chamber has joined forces with the SFT, ASTTI, ITI and the UNAPL to publish a brochure called Translation - Getting it Right. A Guide to Buying Translations. Available in thirteen different languages, it answers many questions that anyone buying a translation might ask and helps the buyer get it right. There are thousands of ways for a translation to go off track: ridiculous deadlines, ambiguities in the source text (which will remain unless the translator asks questions), the “machine translations” that go unrevised, not having a native speaker proofread the drafts, translator with little or no experience or background in the subject of the text, poor coordination of large projects, weak cheap translations, weak expensive translations, no client input, and so on. By following just half of the advice in this brochure, you will dramatically improve your chances of getting a good quality translation. Does everything have to be translated? Could you translate it yourself? Is the translator asking questions? This is a good sign. 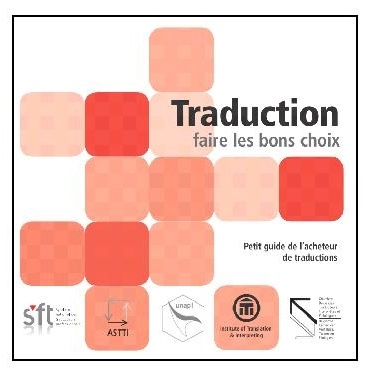 The brochure Translation – Getting it Right can be downloaded for free below (it is available in 13 languages).